Asashio B — Japanese promo premium Tier VIII destroyer. Asashio B is externally very comparable to her Tier VIII tech tree compatriot Kagero. They share nearly identical concealment ratings, maneuverability statistics, guns, and health. The two ships are extremely similar, but Asashio B plays completely differently due to her unique torpedo armaments, and by having the Torpedo Reload Booster ( ) occupying a separate consumable slot (as with Akizuki). Technically speaking, Asashio B is the stealthiest destroyer in her matchmaking spread, having a slightly smaller air detection radius than Kagero and HSF Harekaze. This allows her to control vision and spotting ranges exceedingly well, utilizing her stealth as another layer of armor against enemy vessels. It is armor she desperately needs, as Asashio B’s main weapons are her torpedoes, though her guns can be used in certain situations. It's her torpedoes which make her truly unique: Asashio B is equipped with a deep water variant of the same Type 93 mod. 2 torpedoes found aboard other Tier VIII and IX Japanese ships, and similar to those found in the Pan-Asian destroyer line. They have increased flooding chance, are harder for enemies to detect, and have a whopping 20 kilometer range while still retaining 67 knots of speed... but can only hit battleships and aircraft carriers. As a result of Asashio B only being able to damage battleships and the rare aircraft carrier with her torpedoes, she is a highly specialized ship: designed to really only do one thing, but to do it exceptionally well. She has only her guns with which to combat enemy cruisers and destroyers, a state of affairs that leaves her highly vulnerable to both ship types. Captains should not be afraid to use Asashio B’s guns, however, as strategically engaging key targets can lead to the difference between a win and a loss. Using her concealment to avoid unwinnable fights is also a valid strategy, and can keep her in the game for longer. Stealthy, with a 5.4km surface detection range when fully kitted out. Torpedoes are extremely powerful against battleships. Has access to both Torpedo Reload Booster ( ) and Smoke Generator ( ) at the same time. Slow turrets and slow reload hinder her ability to gun fight other ships, especially destroyers. Torpedoes can only hit battleships and aircraft carriers, limiting her target selection. Slow speed for a destroyer at only 35 knots. The torpedo's long range can make hitting allies a possibility. Her captain needs to keep an eye out for allied ships. No AA defense to speak of. As a Premium ship, Asashio B doesn't have any upgrades to research. Asashio B, like most other Japanese destroyers, makes use of the "standard" suite of commander skills preferred by Japanese destroyer captains: Priority Target, Last Stand, Torpedo Armament Expertise and Concealment Expert. After those four skills, captains can start customizing her to their preferences. Two other Level 3 skills, Survivability Expert and Superintendent, are useful for increasing Asashio B’s survival and offensive capabilities, while the Level 1 skill Preventative Maintenance will help keep her critical modules functioning while under fire. Asashio B is somewhat unique in that she is one of only a few destroyers that can make good use of the Level 2 skill Torpedo Acceleration, as the -20% range penalty that the skill inflicts brings her 20.0 km torpedoes down to 16.0 km; still more than ample range for almost any engagement. The 5 knot speed boost they give her torpedoes in exchange leaves enemies with only a 4.8 second reaction time (exclusive of detection buffs). For captains not interested in Torpedo Acceleration, virtually all other Level 2 skills are also viable (with the exception of Expert Rear Gunner). For increased battle performance, it is recommended that players mount the Premium version of certain consumables. Damage Control Party II ( ) is a good choice for decreased repair time, which is useful when modules are knocked out during the battle. Engine Boost II ( ) provides players with increased duration of evasion capabilities. The most important Premium consumable to mount is Torpedo Reload Booster II ( ). This consumable doubles Asashio's torpedo firepower. The additional charge from the Premium consumable provides more flexibility as the match progresses. As a Premium ship, Asashio B comes included with Type 10 camouflage that lowers her detection radius, reduces the accuracy of incoming shells, reduces her repair costs, and increases the amount of experience she earns. 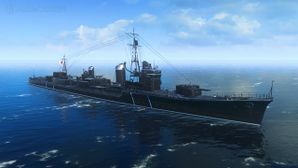 Asashio captains should mount standard signal flags to improve the ship’s performance in battle. Captains looking to improve upon the ship’s armament should mount Victor Lima ( ), Juliet Whiskey Unaone ( ), and November Foxtrot ( ) signal flags. Sierra Mike ( ) signal flags are recommended to increase the ships top speed. Juliet Charlie ( ) flags are also recommended to prevent detonations. Lastly, economic and special signal flags can be mounted to increase the ship’s economic gains per battle. Asashio on sea trials at Sasebo, July 1937. In order to correct the deficiencies found in previous Japanese destroyers, the designers of the Shiratsuyu-class sacrificed performance for design integrity, a decision they were unable to rectify until Japan withdrew from the London Naval Treaties. The Asashio-class of destroyers — part of the 1934 Navy program — were borne out of that necessity of improvement, and history would venerate this class of 10 destroyers to be proficient and capable vessels; they would be the template for all future Japanese destroyer designs till the end of the Second World War. With the shackles of treaty limitations cast aside, the designers opted to push standard displacement past 2,000 tons; the first native destroyer design to do so. The increase in length had the positive ramification of improving crew quarters. While the propulsion set-up was identical to the previous class — 3 Kampon boilers feeding into two turbines, each driving a shaft — the designers opted to use the latest available machinery that ran at higher temperatures and pressures. The outcome was an increase of output to about 50,000 shaft horsepower. Despite the increase of tonnage, the class managed to attain speeds to 35 knots. The setup was not perfect, however; Asashio showed instabilities while turning, which prompted the installation of a modified stern and rudder for the remaining vessels in the class that managed to decrease the turning radius. Other troubles included teething issues with the turbines, which took years to rectify. The most striking feature was the return to the dual-gun only armament setup pioneered on the Fubuki-class. Asashio featured six 127mm guns found in three turrets: one forward with a super firing pair aft. Unlike her predecessors the 'X'-turret was placed elevated on the shelter deck. The design called for the reuse of the Type C turret mounts, which traded gun elevation angle for a lighter, yet fully enclosed, armor shell. As well, the class retained the improved torpedo layout of their predecessors: two (2) quadruple-tube torpedo launchers positioned along the centerline, with a reload stored for each pack in a deck house. For anti-aircraft defense, the destroyers were armed with a meager pair of the new Type 96 25mm cannons in dual-mounts. The bulk of wartime modifications bolstered the sub-par anti-aircraft abilities of the class. The first phase of refits in late 1942 replaced the dual-mounted 25mm guns with triple mounts. The largest refit saw the removal of 'X'-turret in order to install a further pair of triple-mount 25mm guns, and was completed in mid-1944. Late 1944 saw the addition of single-mount 25mm guns all across the forward superstructure. Additionally, all ships of the class received the No. 22 and No. 13 radar sets, installed on the fore and mainmasts, respectively. Asashio (朝潮, lit. "Morning Tide"), the lead ship of the class, was the first ship to be laid down on 7 September 1935 at the Sasebo Naval Arsenal. Launched 16 December 1936, she was completed 31 August 1937. Asashio B was the first destroyer of the IJN to have a displacement greater than 2,000 tons. During her initial trials, she suffered from steering problems and issues with her unreliable new 50,000 shaft horsepower turbines, but these flaws were ironed out for the class as a whole by the beginning of the Second World War. Issues aside, the overall design for Asashio was considered successful, and her design was repeated in the later Kagero and Yūgumo classes. Asashio herself spent her pre-war service in training and modernization to fix her outstanding issues, before Japan joined the war. At the time of Pearl Harbor, Asashio was the lead ship of the 8th Destroyer Division, consisting of Asashio, Ōshio, Michishio and Arashio, stationed in the South China Sea escorting transports bound for British Malaya and the Dutch East Indies. On 19 February 1942, while DesDiv8 were escorting two transports near Bali in the Dutch East Indies, the destroyers came under attack from a combined Dutch-American-British force consisting of two submarines, seven destroyers, and three cruisers. While the three Dutch light cruisers were decently modern vessels, the American Clemson-class destroyers were sorely outdated compared to the four Asashio-class destroyers. In the resulting Battle of Badung Strait, Asashio herself successfully struck the Dutch destroyer HNLMS Piet Hein with a 61cm torpedo, sinking the Dutch destroyer immediately, suffering only light damage in return. She continued to serve around the Dutch East Indies until late May, when she and her division transferred to the central Pacific. She was present at the Battle of Midway, escorting the Support Group that was covering the troop convoys to Midway. On 6 June during the battle, she came under attack by US planes, taking a hit from a 500-pound bomb and sustaining medium damage. She and sister-ship Arashio rescued 240 survivors from the sinking heavy cruiser Mikuma, and then escorted badly-damaged Mogami back to Truk on 14 June. Following repairs that stretched into late October 1942, Asashio returned to the front lines to take part in the Guadalcanal campaign. She saw no combat during her time serving in the Solomon Islands, making several successful transport runs in the area for the rest of 1942. During this time, she helped light cruiser Isuzu limp back to port after suffering damage from the Second Naval Battle of Guadalcanal, then towed Shiratsuyu-class destroyer Umikaze back to the island of Rabaul for repairs, and later escorted Zuikaku, Mutsu, and Suzuya from Truk to mainland Japan. By mid-February 1943 she was back on duty in the southwestern Pacific. While escorting a troop convoy in the Bismarck Sea, she came under attack by a joint US-AUS air strike. The first wave of attacks was devastating: all seven transports took hits that left them burning or sinking, and destroyers Tokitsukaze, Shirayuki and Arashio were sunk. The fourth destroyer and final destroyer to sink was Asashio. While picking up survivors from Arashio the following morning of the strike, a second wave attacked, with a B-17 striking her amidships with a 500-pound bomb, damaging her beyond repair. She sank quickly, going down with roughly 200 of her crew of 226 enlisted men and officers. Asashio was only painted in overall IJN gray. Asashio’s name written in katakana on both sides of the hull are missing. The Type 93 mod. 2 torpedo was actually an experimental type designed in 1935 to meet a staff requirement for a higher speed torpedo for destroyers. It was discontinued in 1941 and did not enter service. 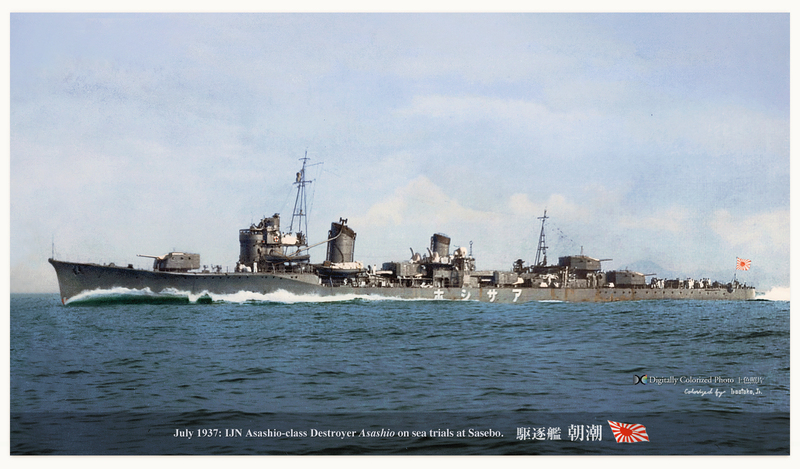 Asashio underway in July 1937. This page was last modified on 23 December 2018, at 07:20.